Whether you’re just embarking on your bodybuilding journey or you have been at it for years, it is important to give yourself a good starting point or to gauge your progress. One easy way to do this is by determining your one-rep max. Your one-rep max is, as the name implies, the maximum amount of weight you can lift in only one repetition. In order to determine your one-rep max, you can use one of the many calculators easily found online or you can use the following calculation. You need to understand your one-rep max to maximize your results. The formula to determine your one-rep max is calculated by taking the number 0.3333 and multiplying that by the amount of weight you used and then multiplying that by the number of repetitions performed. Your One-Rep Max = 0.3333 * Weight * Repetitions + Weight. The most accurate results are achieved when performing repetitions in the range of three to ten. 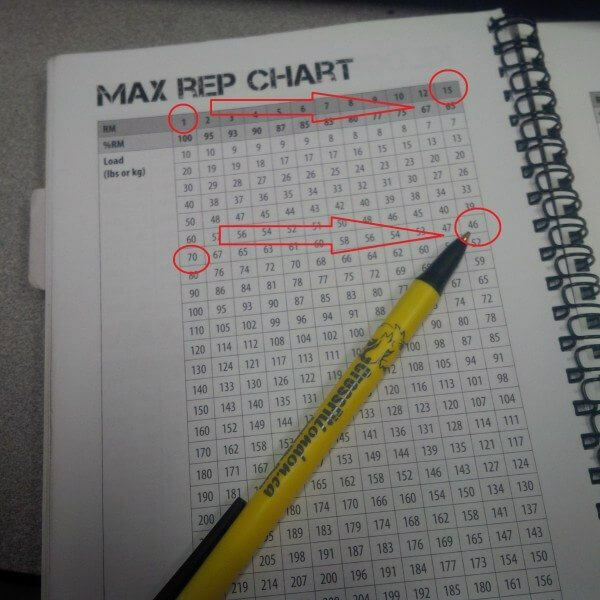 Before engaging in a test for your one-rep max you should follow certain procedures. First you should warm up properly before beginning the test. A good warm-up will ensure your muscles are limber and eliminate any probability of injury. ​The next step is to make sure you have someone spot you. A spotter isn’t entirely necessary, but it’s a good safety precaution. Finally, you should not perform the test unless you have thoroughly rested the muscles you will test for a period of 24 hours. You can test all muscle groups to determine your one-rep max. Squats, bench presses, bicep curls, shoulder presses and triceps exercises can be done to determine the maximum amount of strength you have for each muscle group. People embarking on a bodybuilding program will have a great advantage by knowing their one-rep max. This will give the prospective bodybuilder an idea of their current level of strength. Once this is known, you can devise a workout routine that will suit your goals. If you are looking to gain lean mass, you can use a weight that ranges from 70 percent to 80 percent of your one-rep max. You should be performing repetitions in the range of eight to twelve. If you are looking to get stronger, then you should aim for 85 percent of your one-rep max. Bodybuilders who are experienced can also benefit from knowing their one-rep max. This tool will give a good indication of strength gains. You should perform the test once, and then test yourself again every six weeks. If you notice your one-rep max is increasing, you are on the right path. If not, you can make changes to your workout routine, diet or recovery techniques so that you can continue to progress in your bodybuilding goals. One-rep max testing is very stressful. It takes a period of 24 hours of rest before the test can be performed and this can interrupt your workout schedule. A good idea is to schedule a test the day after a rest day. If you do this, you can avoid missing a day of working out. Another drawback of one-rep max testing is that it can be very stressful on the body. If you truly attempt to lift the maximum amount of weight you can for one repetition, this can overload the nervous system. If proper care isn’t taken (having a spotter, ensuring perfect form), you can risk incurring an injury. The last drawback is that it can be time-consuming. When testing for your one-rep max, you need to perform a series of warm-ups. Bodybuilding athletes usually perform three to four warm-up exercises and then go on to the test. Some feel this can be too time-consuming and that the time could be put to better use. Your one-rep max is a good tool to determine your level of strength. You can use online tools or easily use the formula given above to determine the maximum amount of weight you can lift. ​Some may feel that it is time consuming, stressful and that it will interrupt an already intensive workout schedule. But in the end, it will be worth it to know exactly how much weight you can lift. Knowing this will either let you know you’re doing things correctly or let you know that you need to make changes in order to move forward with your bodybuilding goals.